Amenities: 24-hour concierge & parking attendant, pool, spa, barbecue area, gym, bike storage area, residents lounge, business center and conference rooms. Fifteen guest parking spaces in the underground garage. Other: Park Places is the closest condo to Seaport Village. Offers some of the best unobstructed bay views over Seaport Village. West: Park Place condo shoppers be careful about viewing west facing condos on line. Most often the bay view photos are taken at either a SW or NW angle. That’s because directly west about 100 feet away is a Embassy Suites hotel. This hotel appears to be about 15 stories tall, but has a tall roof top on it. In my opinion you need to be about the 20th floor of the Park Place condos to clear the hotel. Speaking of view to the NW & SW, the SW is a lower risk view than the NW. On the parking lots to the NW of Park Place will be major development of various buildings, some low rise, some high rise. The proposed construction project is called the Broadway Complex and the North Embarcadero Visionary Plan. North: Views to the direct north will also be impacted by future construction. See comments in the West section above plus you have a high rise condo planned for the current Office Depot site a few hundred feet to the North. East: The East views from Park Place seem unlikely to change much if at all. However, note there are a few small one or two story buildings directly across the street going East that could be sold to a high rise developer one day. Currently these east views go on forever, sure there are high rises in the distance but it’s a great panoramic view and a private view as no other high rises are close looking east. South: This is the most sought after view in the Park Place condos, you can see the bay, Coronado Bridge and night lights of Mexico. It’s a very unobstructed view as long as you look directly South or to the SW. Views to the SE are view corridors between the twin tower Hyatt buildings. They are beautiful hotels to look at but they do block some of the bay views. Note: These views may change in the future or if you are on a very low floor may not have any view. Each buyer should verify on their own. Above statements are only one man’s opinion at one point in time and are not guaranteed to be accurate. Like the most: Residents here enjoy the unobstructed bay views and close proximity to Seaport Village and the walking paths along the bay. 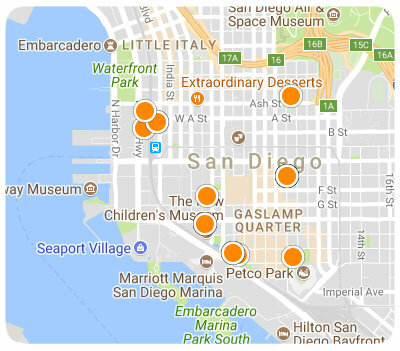 Residents feel they are at the "center of everything" as its location is not far from the bay, Little Italy, and the Gaslamp. Like the least: The main complaint with all survey respondents is the noise from the trolley and the train. Some residents have complained about the excessive noise from neighbors. Some complaints were expressed with the standard finishes provided by the builder. Other comments: The building is beautiful, a showcase. This building is located at a main train and trolley road crossing with a bell signal that is activated over 50 times a day. Units on the west side of the building are the quietest. Because the gym is built over a residential unit the hours are restricted and you are not allowed to talk on your cell phone in the gym or make other loud noises.